Trailblazer Gary Thompson celebrates after finishing the 2016 Hospital Hill Run half marathon course in Kansas City, Missouri. Run 70 marathons by age 70. That was Gary Thompson’s goal, and he exceeded it. His most recent race was the Shamrock Marathon last month in Virginia Beach. It was his 72nd marathon at “70 years young,” he said. For Gary, a professor in the law and criminal justice department at Monroe Community College in Rochester, New York, running is about more than fitness. It’s about travel, being social and doing something good for others. 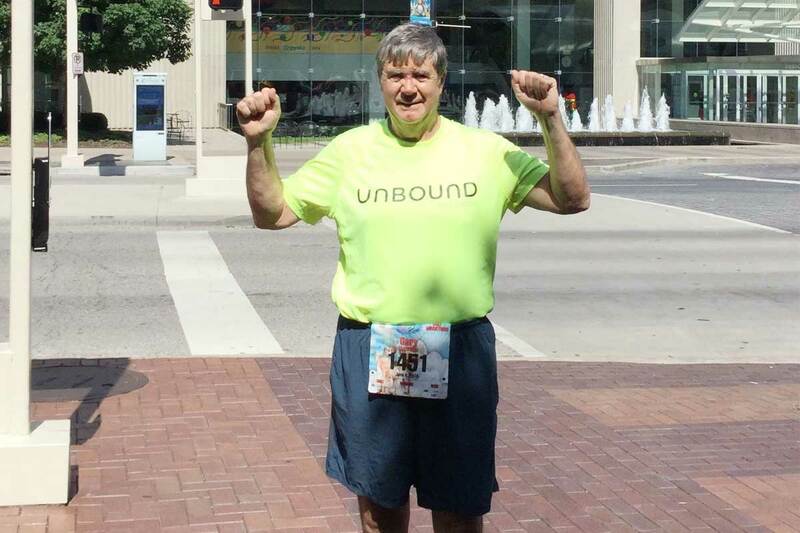 He’s signed up to run a half marathon with the Unbound Trailblazers at the Hospital Hill Run June 3 in Kansas City. The event also includes 5K and 10K races. Gary has seen the world through running. He’s run marathons along the Great Wall of China, in Athens on what’s said to be the original marathon course, and in cities across the U.S. 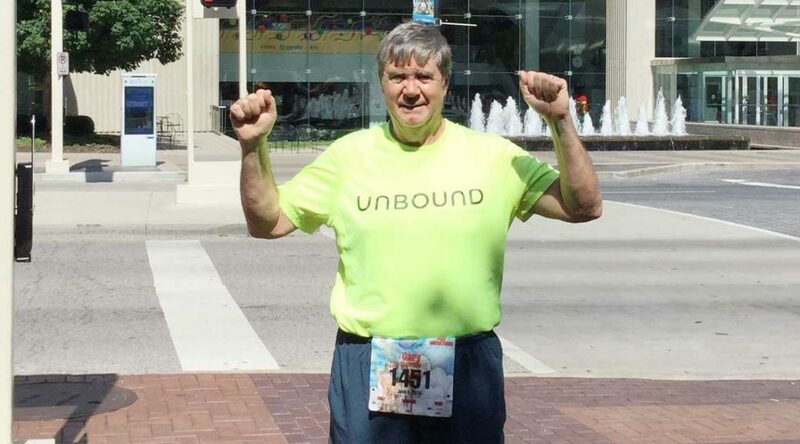 He ran the half marathon with the Trailblazers last year at the Hospital Hill Run after learning about it from his daughter, Michelle Dawson, who works at Unbound. While the fundraising went well, Gary’s race wasn’t as smooth. Almost 10 miles in, he slipped on some gravel while trying to pass a group of walkers. He fell, and the cut he got on his head required a trip to a nearby hospital and nine stitches. For the first time, Gary didn’t finish a race. Not then anyway. The next day, after his morning coffee, he felt like going for a run. Gary went back to the spot on the course where he fell and ran the remaining 3.2 miles. The finish line was still up from the day before, and someone who was there took a photo for him. Gary has been running for most of his life, since high school and the military. For those just starting out, he recommends signing up for a local walk or run and training with a group. He runs every Saturday morning with friends, and they go out for coffee afterward. Gary looks forward to running with the Trailblazers again at this year’s Hospital Hill Run. “I think I’ll train better, so that I’ll try to finish in the same day I start,” he said. Loretta joined Unbound in 2000. She brings more than 30 years of experience in journalism and organizational communications to her role as managing editor. Her passion is telling stories of children, families and elders served by Unbound around the world. Loretta is a graduate of Drake University’s School of Journalism and Mass Communication in Des Moines, Iowa.